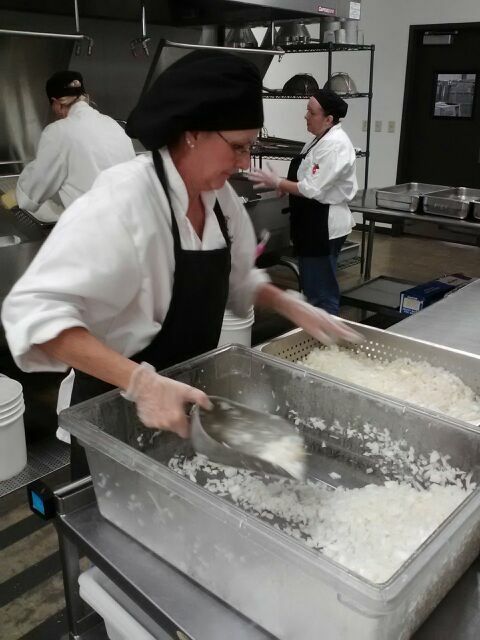 Just a year after the Greeley-Evans School District 6 nutrition services staff began converting student lunches from processed food to scratch cooking, a food renaissance has spread throughout district cafeterias. The district is buying its fruits and vegetables from local farmers, serving more students breakfast and creating 75 percent of its entrees from fresh, healthy ingredients. Before this effort began, only 20 percent of student lunches were made from scratch. Nutrition Services Director Jeremy West is shooting for 100 percent scratch meals for the district's 10,000 customers. "We know if students get good nutrition, they do better in school," said West. West is chairman of the Colorado Farm to School Task Force, a group created by the Colorado General Assembly to study, develop and recommend policies and strategies for implementing Farm to School initiatives. The task force helps provide statewide technical assistance on a range of farm to school issues, including food hubs such as Greeley's. With more than 30 million children eating lunch at school five days a week, 180 days a year, healthy school lunches have the ability to increase student performance, reduce obesity and connect schools and students with nutritious, locally-grown food. The Greeley Tribune article, "District 6 entering second year of food changes," describes the progress made in healthy school food preparation during the past year. It’s a busy morning at the Greeley school food hub. 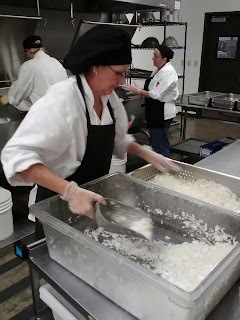 Staff efficiently process onions and beans for later use in burritos. By later, I mean months from now, like January. The freshly processed onions are placed alongside rows of other neatly stacked bags of frozen vegetables, such as celery and carrots, in a cavernous industrial freezer. This is just a typical day for Jeremy West, Weld County District 6 Nutrition Services Director, whose morning has just begun. “I have a great team and we have plans to continue making improvements to this food hub” said Mr. West, as we toured the revitalized central kitchen facility. As Mr. West shows me the freezer—it’s large enough to operate a fork lift inside—I notice the shelves contain only a few boxes. “Years ago, this place would be packed floor to ceiling with boxes of processed food. Since we started scratch cooking, it’s almost empty” said West. The phased food hub vision includes expanding access to locally grown foods for the entire community, including the Weld County Food Bank, the local hospital, and colleges. The food hub supports an economic boost for local farmers and tastier and healthier meals for students. Last year, Mr. West purchased more than $600,000 dollars of local produce and dairy while improving the nutritional quality of student meals. By cooking dry pinto beans that were literally grown “just down the road” instead of commercially processed beans, the district saved transportation costs and dropped sodium levels by 300 mg per serving. “Yes, the advantage of scratch cooking is enormous”, said a grinning Mr. West.